Exporters of body armour, german shield, battle axes, german sword, japanese dagger, scottish claymore swords, rapier swords, knight swords, medieval shields, batlle axes, roman daggers, daggers knife,etc. President Sword also known as ‘Persian Curved Sabre’ has been used by the Turks and Persians during the conquest of Europe. We offer an exact replica of Medieval President Sword to the clients, which make us stand among the well known President Proclaims Sword Manufacturers in India. Japanese Sword as we know of today is a deadly curved blade sword, started originally as a straight sword used by samurai fighters. Japanese Samurai Sword emerged as a standard fighting equipment of the fearless samurai warriors. Acquire the precise copy of deadly Japanese Sword from us at nominal price as we are recognized as one of the Authentic Japanese Sword Manufacturers in Mumbai. Scottish Broadsword imitations crafted by our team of professional artisans come with full basket brass hand guard and straight blade. We have marked specialization in offering Cold Steel Scottish Broadsword with leather scabbard and metal scabbard. Additionally, our company has become a trustworthy Medieval Scottish Broadsword Supplier. Trooper Sword was the preferred choice of soldiers belonging to North and South, because of its stylish design. It is believed that the Cavalry Trooper'S Sword was originated in the North and the Southern Sword smiths copied their union design. Customers can avail this artistic piece of Trooper Sword from us, with steel scabbard and brass handle. We are reckoned globally as one of the prominent Civil War Trooper’s Sword Exporters, based in India. Anglo Saxon Swords are among the foremost choice of medieval items collectors because of their unique design. We offer Trewhiddle Style Anglo-Saxon Sword with a straight and double edged blade, along with a matching scabbard. Our company has marked its presence in the market as one of the eminent Antique Anglo Saxon Sword Manufacturers. Lion Heart Sword, which was used by Richard I, The king of England. We present Medieval King Richard Lion Heart Sword with a leather scabbard for that same look. 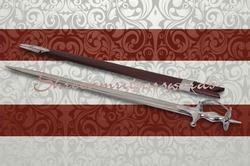 Our company has emerged as one of the reliable Squall’s Lion Heart Sword Suppliers in the country. German Sword has always been considered a war style statement of Medieval German Warriors. The double edged tapered blade and a comfortable long grip handle of these Medieval German Swords makes them foremost choice of every collector. Our perfection in carving the similar antique items has made us stand among the trustworthy Antique German Sword Manufacturers in Mumbai India. Briquet Saber Sword is the finest piece of Sabrage art, which became popular in France at the time when the Napoleon Army visited many of the Aristocratic domains. The replica of Briquet Short Sword offered by us comes with pure leather cover along with brass dressings and brass handle. We have carved a niche for ourselves as one of the ace French Infantry Briquet Saber Sword Exporters from India. Roman Gladius Sword is considered the most elegant and well known weapon of the Roman Officers. Short in size these Medieval Roman Gladius Swords were used to thrust the opponent. Available with sharp point double edged blade and beautifully decorated etched design, increases the demand for these swords in global market. We are regarded as one of the accounted Authentic Roman Gladius Swords Manufacturers in India. Pig Face Helmet become popular during the 13th century and was also known as the ‘Hounskull Bascinet’ at the end of 14th century. Medieval European Pig Face Helmets are known for their unique designs. Buyers can avail the exact imitation of pig face helmet from us in any specifications as per their requirement. Our company has become one of the reputed Medieval Knight'S Pig Face Helmet Exporters. It is said that the Arthurian Helmet was used by the King Arthur, at the time when he was defending Britain from the Saxons all through the 5th century. This is the main reason why Arthurian War Helmet is popular among the people. 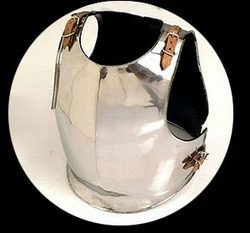 We have gained popularity as one of the prominent Medieval Arthurian Helmet Manufacturers in India. 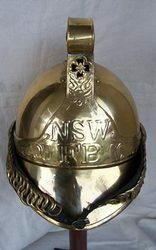 Fireman Helmet offered by our company is a genuine reproduction of the 20th century fire brigade helmet of South Wales. Leather work is also done inside the helmet for giving the look and feel of bygone era. Shaabas replicas have emerged as a reputed Brass Fire Helmets Manufacturer and have also established itself as one of the prominent Medieval Fireman Helmet Exporters from Mumbai India. 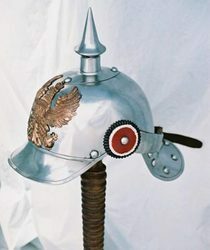 spangenhelm Helmet was the first and foremost choice of the knights of the middle age. The Black Spangenhelm Helmet got its name from the individual plates called ‘Spangens” forming the round top. We offer the exact replica of Spangenhelm helmets at pocket friendly price. 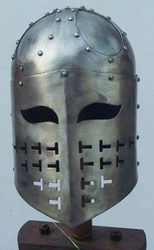 Our company has marked its presence as one of the reliable Medieval Norman Spangenhelm Helmet Suppliers. Roman Officer Helmet was generally worn by the officers of the powerful Roman Army. 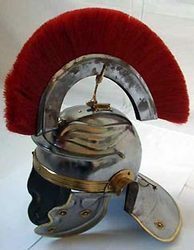 The Medieval Roman Officer Helmet is designed specifically for making the face of the officers more visible to the troops while leading them in combat. For providing the same reproduction of Roman officer helmet, we are regarded as one of the noted Medieval Steel Helmet Manufacturers in India. Designed originally by King Frederick William IV in the year 1842; the Pickelhaube Helmet is known for its artistic design. The early Russian pickelhaube helmet possess spike as a holder for a horse hair plume during full dress practice. The same tradition is still followed by some Prussian Models using German Pickelhaube Helmet. Additionally, our company is recognized as one of the pre-eminent Leather Pickelhaube Helmet Exporters from Maharashtra. Sutton Hoo Helmets were believed to be used during the 7th century. It is said that the original Sutton Hoo Armor Helmet was found in a rich boat burial in Sutton Hoo, England. 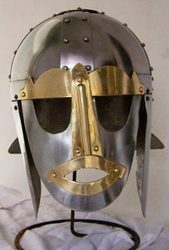 We have been offering the exact imitation of that Sutton Hoo helmets to the clients that has given us the distinction of one of the trustworthy Medieval Sutton Hoo Helmet Manufacturers. Neck guard, shoulder pauldrons and besagews combined together makes a unique Metal Neck Plate, used by the warriors for covering their neck, shoulders and armpits. 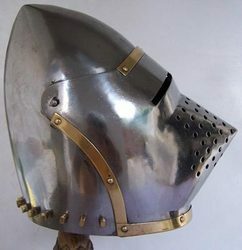 The Brushed Metal Neck Plate is considered an excellent addition to a breast plate, chain armor and leather armor, as it was used to provide maximum protection to the knights. Flawless replicas of these neck plates offered by us have made us stand in front row with the row ranking Armour Neck Plate Manufacturers in Mumbai Maharashtra. 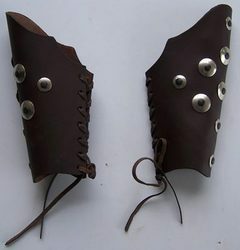 Used prominently by centurions for covering their arms these Leather Bracers are perfect option for passionate collectors. Leather arm bracers can be tied easily around the arms, with the help of laces, as they offer complete arm protection for combat re-enactors. Shaabas Replicas has become a renowned Leather Arm Bracers Manufacturer and also gained popularity as one of the notable Leather Wrist Bracers Suppliers in India. Spaulder is a kind of armoured plate worn over the suit of plate armour. It is used for protecting the upper arm and shoulder area. These spaulders continued to be worn during the Renaissance era. Customers can avail Wholesale Leather Spaulder from us at any point of time. 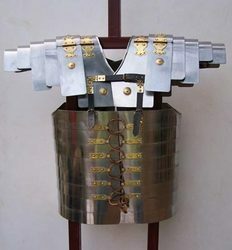 We have been exporting these spaulders to international market on regular basis and are regarded as one of the trusted Antique Armour Spaulder Exporters from Mumbai Maharashtra. Material used: Carbon steel, wood and leather. 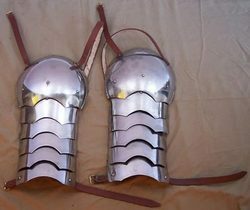 It is a type of segmented body armour used by the Roman Empire. The Romans referred to the armour as Lorica Laminata.